Synchronised swimming has changed its name to artistic swimming! Whether you call it artistic swimming or synchronised swimming, what exactly is it anyway? It can be classed as both an art form and an Olympic sport, although most people still associate it with the water ballet shows from the 1950’s MGM musicals starring Esther Williams. However, there is so much more to this aquatic form than float patterns, flowery caps and girls smiling. Synchronised swimming in the sporting world is now officially called artistic swimming. This was passed by the world governing body for aquatic sports, FINA, in 2017. With the International Olympic Committee wanting the sport of synchronised swimming to sound more athletic, it suggested bringing the name into line with a similar physical Olympic sport, artistic gymnastics. Be sure to look out for artistic swimming on the next Olympic Games timetable for 2020. The name artistic swimming certainly describes the wider range of aquatic performances in the entertainment world. However, the name ‘synchronised swimming’ and ‘synchronised swimmers’ is still the most common name for it and will be around for a good few years yet. Therefore, I have kept to those terms for the purpose of this article. Since the 1984 Olympic Games, held in Los Angeles, synchronised swimming has been on the Olympic schedule. Previously only the duet and solo (yes solo synchronised swimming is such a thing), events were contested, but the sport showed a rise in public popularity when the team event was introduced in the Atlanta 1996 games. Since 2000 Russia has lead the way in taking the sport to new athletic levels, with dynamic, fast moving choreography, acrobatic lifts and swimmers holding half their bodies out of the water, all whilst holding their breath for around 2/3rds of a routine. It is one of the most physically demanding sports in the Olympics and always one of the first to sell out. Synchronised swimming is still very much dominated by females. However back in the late 19th century, men performed water displays which had progressed from life saving skills, and called it ornamental swimming. 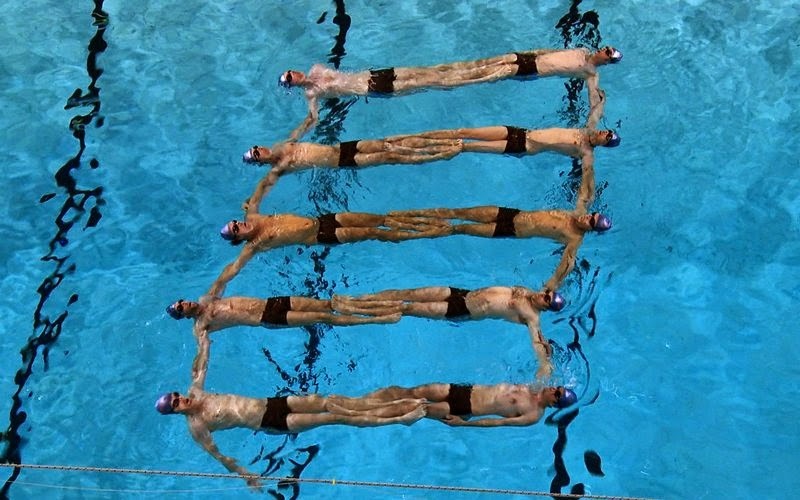 Some believe this was the first form of synchronised swimming. With the world becoming more open to gender neutrality, synchronised swimming is opening the doors for more men to compete. 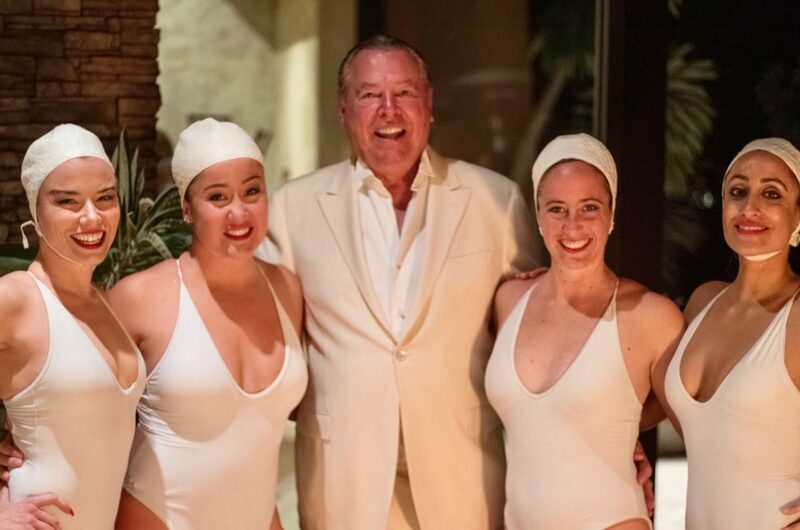 Men have been able to compete in open competitive events for a few years with Bill May showing he could compete with the world’s best females and then taking a lead performing role in Cirque Du Soleil’s aquatic show ‘O’ in Vegas. The world governing body for aquatics, FINA, has allowed men to compete in the mixed pairs events since 2014. Still waiting for Olympic recognition, the mixed pair duet event has proven popular with the crowds, so hopefully this means that more and more boys will be taking up synchronised swimming. On the other end of the spectrum, a group of middle aged Swedish men began synchronised swimming as a past time which the documentary ‘Men Who Swim’ showed helped them meet others and support each other though life’s difficulties. With the British film ‘Swimming With Men’ which is based on that documentary, starring comedian Rob Brydon, Downton Abbey’s Jim Carter, BAFTA winning actor Adeel Akhtar and Daniel Mays, being released in 2018, synchronised swimming men will become a trend for pool parties. Aquabatix now has a group of male synchronised swimmers for event entertainment performances to meet this growing trend for 2018. Anyone who was watching Britain’s Got Talent in 2012, will remember the unique act Aquabatique, four synchronised swimmers performing in a glass tank of water. Making it all the way to the finals, the group then went on to perform in Stella McCartney for Adidas SS14 fashion show, a Nivea experiential event created by Jack Morton in the middle of Covent Garden, plus secure a residency show in a water park in the UAE for two years. Seeing people move and perform together under water has a mesmerising effect that captivates everyone and is rarely seen. Synchronised swimmers often perform in aquariums amongst the fish and water tanks for corporate and public events. Sometimes even as mermaids and mermen. Cirque Du Soleil’s incredible aquatic show ‘O’ first hit the Las Vegas strip in 1998 at the Bellagio hotel. It is still going strong today, featuring breath capturing performances by synchronised swimmers, divers and acrobats. The stage floor moves up and down so slickly, from being a deep tank full of water to being a dry floor, that you don’t even notice that someone is suddenly running around on what was where legs were sticking up from underwater only a couple of minutes before. Franco Dragone went on to create ‘Le Reve’, the other big water show in Vegas, which opened in 2005. The House of Dancing Water in Macau, also created by Dragone, then opened in 2010. 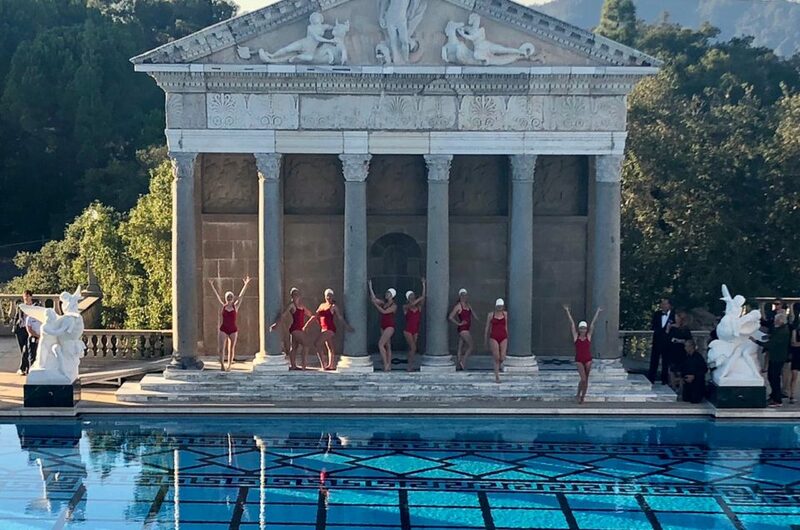 Synchronised swimmers perform with such artistry in these big shows, that the choreography takes it away completely from the sport and the 1950’s MGM musical style of performance, making it much more of an art and cirque form of entertainment. The flowery swim caps, glamorous looking women wearing 1950’style swimsuits and lovely looking kaleidoscope patterns forming on the water surface is still as popular today as it was back then. Watching several people perform in unison with synchronised movements, inking up bodies to create one unit and performing it all to music is completely captivating, let alone with the backdrop of water. It is something most people cannot do, or have even seen live so it will always capture the attention at a party. 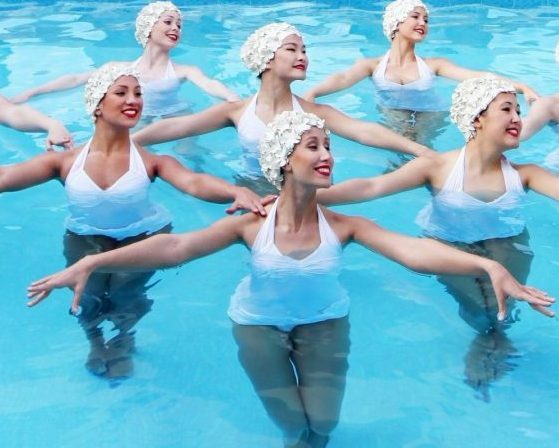 Whilst synchronised swimming has progressed significantly since the 1950’s, old Hollywood water ballets will always be seen as the ultimate in glamour entertainment.